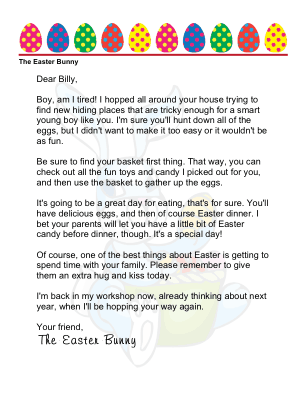 This printable letter from the Easter Bunny to a little boy is intended to be delivered on Easter morning and talks about the thrill of the egg hunt. Boy, am I tired! I hopped all around your house trying to find new hiding places that are tricky enough for a smart young boy like you. 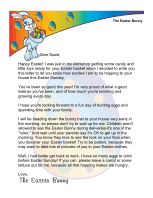 I'm sure you'll hunt down all of the eggs, but I didn't want to make it too easy or it wouldn't be as fun. Be sure to find your basket first thing. That way, you can check out all the fun toys and candy I picked out for you, and then use the basket to gather up the eggs. It's going to be a great day for eating, that's for sure. You'll have delicious eggs, and then of course Easter dinner. 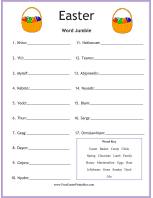 I bet your parents will let you have a little bit of Easter candy before dinner, though. It's a special day! Of course, one of the best things about Easter is getting to spend time with your family. Please remember to give them an extra hug and kiss today. I'm back in my workshop now, already thinking about next year, when I'll be hopping your way again.